This pretty cut glass bowl sits on little curly que legs. Cut and highly polished. Pretty buzz star pattern. Measures 6 1/4" tall and is in perfect condition. Lid has a little cut out area for the spoon. This is a beautiful piece. 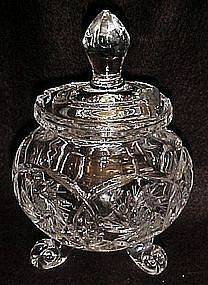 It could be used as a sugar bowl, or for jelly or honey.